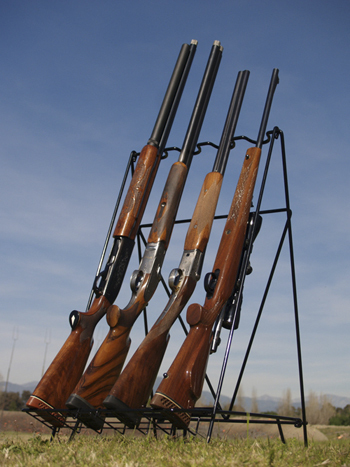 The Portable Rifle & Shotgun Rack's patented design provides for convenient storage of up to four shotguns or scoped rifles, both in and out of soft gun cases. The Portable Rifle & Shotgun Rack is made of heavy gauge formed steel wire and then powder & plastic coated to protect the finish of your guns. The Portable Rifle & Shotgun Rack collapses for easy storage and is designed for both indoor and outdoor use.